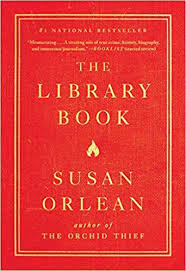 The Library Book by Susan Orlean was a thorough and interesting look at something that at first blush may not seem to lend itself to a compelling narrative, however she very much succeeds with the effort. Orlean centers the book around the Los Angeles Central Library and a devastating fire that swept through it in 1986 and also covers what libraries have been through history, what they are today, and what they mean to her. About the fire, which burned for seven hours, with more than one million books burned or damaged and almost every firefighter in Los Angeles called to fight it, Orlean wrote an amazing description, as if she was there and narrating it, of how the fire reached a point where it had exactly enough air available to consume everything in its reach, and burned in a colorless or pale blue hue. Additionally, she covered the investigation into the cause of the fire, with people focusing in on a particular suspect in the compelling serial liar and attention seeker Harry Peak. Orlean also wrote heavily on the history of both the Los Angeles Central Library and libraries in general and their import in the world, with how in war or with a tyrannical regime, destroying books a way to show people you can take from them. About libraries today, she wrote of them as something that provides in addition to books, access to pictures, music, maps, classes, and services for the community, including a place to go for the homeless, which makes their presence there and reaction to them important. Additionally, Orlean writes well about librarians, many of whom love the places and are second-generation library workers. The book includes a fair amount of compelling first-person writing, with Orlean writing on taking her son to the library, just as her mother took her, and how she chose to write the book to help preserve that memory of her. She then wrote of memories and the permanence of books and words, noting that in Senegal, the polite expression for saying someone died is to say his or her library has burned, and how if some of that metaphorical library can be shared, it takes on a life of it's own. With The Library Book, Orlean serves as a wordsmith crafting great narrative and provides a deep-dive homage for people who like books, libraries, community, and interesting stories of the everyday. 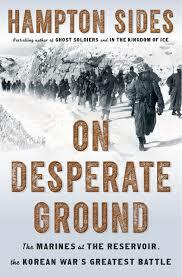 On Desperate Ground by Hampton Sides was an excellent book about U.S. Marines in the Korean War being surrounded in the mountains by a much larger force of Chinese troops and fighting their way back to safety. Sides details how in 1950, General Douglas MacArthur, Commander of all U.S. and U.N. troops in the Far East, had the Marines make a push across the 38th parallel separating North and South Korea, with the goal of going all the way to the Yalu River separating North Korea from China. MacArthur's belief was that Chinese wouldn't enter into the war and the hubris on the part of he and his Chief of Staff, Major General Ned Almond, resulted in a force led by some twenty-thousand men of the First Marine Division commanded by General Oliver Prince North being flanked by what was likely several hundred thousand Chinese soldiers. Much of the fighting in the mountains took place in sub-zero temperatures around the Chosin Reservoir, with a single 100 mile road there from the coast, and the Chinese trapping the Marines in the mountains, letting them progress up the road and then blowing bridges behind them. It was a remarkable escape, aided heavily by the Marines building an airstrip in the mountains at Hagaru, replacing a blown-out bridge to safety by flying in and dropping multi-thousand pound bridge pieces, the rescuing of men from the frozen-over reservoir, and by a battalion of 450 Marines who went overland to come to the aid of a company of Marines, Fox Company, who would have otherwise almost certainly have been all killed or captured. The tales of individual heroism was compelling reading, with those featured in the book along with General North including Sergeant Robert Kennemore, Lieutenant John Yancey, Private Hector Cafferata, Private Jack Chapman, Lieutenant Chew-Een Lee, Navy pilots Ensign Jesse Brown and Lieutenant Thomas Hudner, Private Ed Reeves, and Lieutenant Colonel John Partridge, who oversaw the building of both the bridge and airstrip. 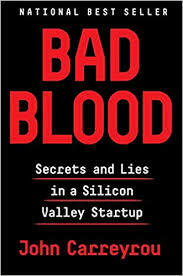 The book in the beginning makes mention of Sun Tzu's notion that there are nine different kinds of battle, and that "the final and most distressing type is a situation in which one's army can be saved from destruction only by fighting without delay, a situation that Sun Tzu calls 'on desperate ground,'" and after the war, causality numbers stated by the Pentagon had the battle at and around the reservoir pegged at some 750 Marines killed, with 3,000 wounded and 200 missing, and the Chinese forces having an estimated 30,000 killed and 12,500 wounded. Overall, it was noted that 33,000 Americans died fighting in the Korean War, 180,000 Chinese troops, and 2.5M Korean citizens, and Sides in the book tells the story of this particular battle via a combination of deep reporting and narrative tales of individual heroism in the face of close to insurmountable odds. 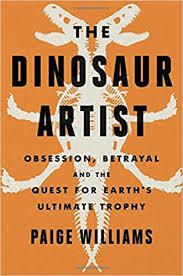 The Dinosaur Artist by Paige Williams has the subtitle Obsession, Betrayal, and the Quest for Earth's Ultimate Trophy and tells the story of Eric Prokopi, described in the book jacket as "a thirty-eight-year-old Floridian, whose singular obsession with fossils generated a thriving business hunting, preparing, and selling specimens." Along with finding fossils in the United States, Prokopi went to Mongolia and arranged for bones to be sent from there, which is what led to the auction of a reconstructed dinosaur and arrest of the book's subject.